For the perfect private dining experience in London Bridge, visit The Coal Shed London. Hire the Gennaro Room at The Groucho Club for your next London venue hire - the best options for private dining room hire or party venues London has to offer. The Nine Kings suite at Royal Lancaster London is acknowledged as Europe’s ultimate venue for product launches, conventions, and a wide range of amazing events. Proud City not only manifests the glamour of a bygone era, but adds that extra dash of sparkle to your event. Hire the Nash Room at Hotel Café Royal for your next venue to hire in London! Hire the Dining Room at The Surprise for one of the best private dining rooms London has to offer. Hire the Private Dining Room at Gaucho Tower Bridge for one of the best options for private venue hire London has to offer. Hire the Melville Room at Chiswell Street Dining Rooms for your next private dining venue hire in London. Hire The Sameul Room at Chiswell Street Dining Rooms for your next London private dining venue hire. Hire the Dining Room at the Bull and Gate pub for your next private dining room hire in London. An exclusive dining experience can be a great chance to build and foster business relationships or to make your team feel valued. As London is a veritable hub of cultural and culinary diversity, finding the best private dining room that suits your needs can be difficult. That’s why we’ve found the best venues for you all in one place. Making finding a restaurant to hire easy. From the latest celebrity hot spots to exclusive Michelin starred restaurants; eccentric eateries to Spaces with a story, HeadBox has got you covered. From Soho to Shoreditch and Mayfair to Marylebone, HeadBox has London’s top restaurants, local favourites and under-the-radar Spaces guaranteed to impress your Guests. If you’re on a budget, HeadBox offers bespoke pricing so that you can find the right venue at a price that suits you. So whatever your budget or location, you can search, book and pay for the best restaurants in London. And if you need a helping hand? Just talk to a member of our concierge team for some free and tailored advice. Top things to consider when planning a private dining event in London. There’s lots of things to think about when planning a private dining event. Whether you’re wining and dining an important client, treating your hardworking team after a successful quarter or celebrating a special occasion, you really are spoilt for choice. We like to make the event planning process run as smoothly as possible so we’ve put together a handy guide on all the top things to think about when planning a private dining event in London to get you started! The first thing you need to think about is what type of food you would like to offer your Guests as London has hundreds of cuisines from authentic Asian eateries to fresh seafood restaurants that all offer amazing private dining options. Also, start thinking about what type of evening you want to host. Do you want to go for a fine dining theme? Or do you want something a little more unusual with a themed London restaurant? There plenty of options so do some research and pick out something that best suits you. 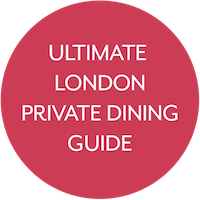 If you’re stuck on what you should go for then check out HeadBox Ultimate Guide to Private Dining in London for some inspiration! Next up, start thinking about where you want to start looking for a private dining venue, keeping in mind that it needs to be easily accessible for the majority of your Guests. We always recommend no more than 20 minutes from where-ever they are travelling from, particularly if it's after office hours. Keep in mind how close venue is from major tube lines or train stations so that your Guests don't have to worry about transport. London is jam packed with restaurants to hire - so you'll be spoilt for choice, but at least you can eliminate some of the options by where they're located. If you've now found a few private dining rooms that could work for your event always plan a site visit with the venues events team. We always recommend visiting the Space before booking so that you can discuss the specifics with the in house team. You can get a good feel for a Space that you can't get from photos and this will enable you to eliminate some of your choices and find the perfect dining spot. Whilst you are looking at the venue be sure to check it has all the facilities you might need. Whether that's disabled access, lifts, baby changing facilities or cloakrooms - this could be a crucial decider if you're still stuck between a few different Spaces. If it’s a venue that’s slightly off the beaten the track and not easily accessible by London tube then make sure there’s parking either on site or close by. If you wanted to play music throughout the event make sure this is a possibility and ask what you need to bring with you in order to play your own soundtrack. If you’re hosting a big event with lots of VIP’s then ask the venue about security. Some venues may already have a security team especially if it’s a Friday or Saturday. So check with the venue first before looking into this. Whilst at the site visit try to keep your budget in mind. Make sure you're fully aware of how the pricing structure works at your chosen London venue and whether it works on the basis of room hire fees or minimum spend. There may even be a delegate rate for corporate dining events so find out all the options and select the one that best suits your budget. There may be some extra hidden fees too including corkage fee, overtime fee and cancellation policies, so make sure you’re fully aware of all these before the event so there won’t be any surprises on the night. Now for the exciting part! Make sure you take a look at all the menu choices the venue has to offer. You want to make sure there is something on there for all of your guests. These days most venues can accommodate for allergies and dietary requirements but it's always best to check beforehand. If any of your guests need Kosher or Halal meals you should always check with the venue before you confirm your booking. Most chef’s will be used to any special requirements but it’s best to keep them updated as soon as possible so they have plenty of notice if things need to be ordered in especially. Once the food is out of the way, the next big decision to make is the drinks. Do you want to have an open bar or a selection of your favourite wines on the table for your guests? You can select certain items to be included in the minimum spend such as the house wine, beer and single spirit mixers and then anything else your guests want to order they can pay for separately. Whatever you want to do most London venues will be more than happy to come up with a solution that best accommodates your needs. Most venues will be able to accommodate your private dining event in a range of different layouts so have a think about what would work best. Guests can either be arranged on round tables or along one long table in a boardroom style format. If you have less than twenty Guests attending it would probably be best to have a boardroom style table that can then be lavishly decorated for a real banquet style event. However if you have any more than twenty Guests we’d recommend using smaller round tables and then allow time for mingling after the meal so your Guests can network with those Guests who may not have sat on their table. Every venue is different so check with the in house team on which layout style they think would work the best for your event. Once you have everything at the venue confirmed and organised it's time to send out the invites. Make sure you give guests plenty of notice and you keep the venue updated with the number of attendees, as this may change in the lead up to the event. You may also need to pre-order the food and it make take some time to collect from your Guests, so be sure to allow for that aswell. Most venues will be fine with last minute changes as long as you keep them updated. Try not to turn up on the day with any major changes that could be difficult for the venue to remedy on the day of the event, of course there may be unfortunate last minute changes which are out of your control, but we always say that communication is key. You've now got all your guests RSVP's, pre-orders collected and all the other arrangements have been made at your chosen private dining venue, the last thing to think about is where to take your Guests for a little after party once dinner is over London is full of late night party venues that will be perfect to explore with a few of your Guests for one last drink before you head home. We hope you’ve found our guide on ‘Top Things Consider when planning a Private Dining Event’ useful! And be sure to check out our private dining collection for some inspiration.